A tasty seafood dish that will make your lunch a special treat. 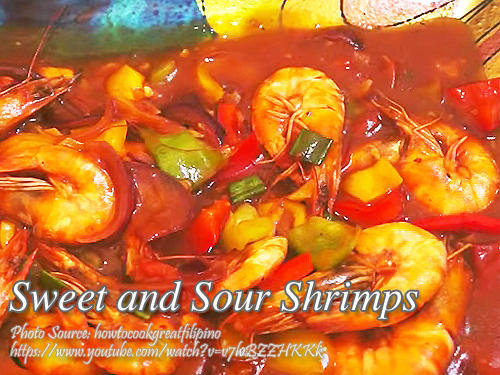 If you are thinking of a sweet and sour dish and want to try something different other than sweet and sour fish or pork, then this sweet and sour shrimps is a good alternative. In cooking this shrimp recipe, you can either peel, remove the head and devein the shrimps. But the better way is by leaving the shrimp intact, just removing the antennae because the savory flavor of the shrimp comes from the head. To cook sweet and sour shrimps; In a medium size wok, heat oil and saute ginger. Then add garlic and saute until fragrant. Then add onions and saute again until soft. Add in the tomatoes and saute until it is soft and cooked. Add in the tomato sauce, banana catsup, cornstarch slurry, vinegar and sugar. Mix until the cornstarch is well blended and the sauce thickens. Next, add in the shrimps. Stir until the shrimps are coated with the sauce. Cover and simmer for a few minutes. Add water if necessary. Then add in the patis, salt, pepper, spring onions, siling labuyo and bell peppers. Stir cook, cover and simmer for a few minutes until the peppers are half-cooked. In a medium size wok, heat oil and saute ginger. Then add garlic and saute until fragrant. Then add onions and saute again until soft. Add in the tomatoes and saute until it is soft and cooked. Add in the tomato sauce, banana catsup, cornstarch slurry, vinegar and sugar. Mix until the cornstarch is well blended and the sauce thickens. Next, add in the shrimps. Stir until the shrimps are coated with the sauce. Cover and simmer for a few minutes. Add water if necessary. Then add in the patis, salt, pepper, spring onions, siling labuyo and bell peppers. Stir cook, cover and simmer for a few minutes until the peppers are half-cooked. Serve hot. Hi Ale, thanks also for the kind words! God bless you too!